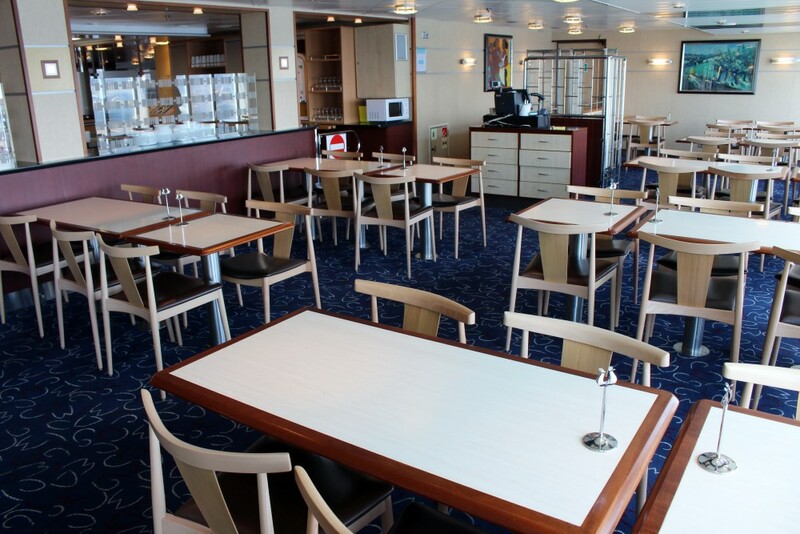 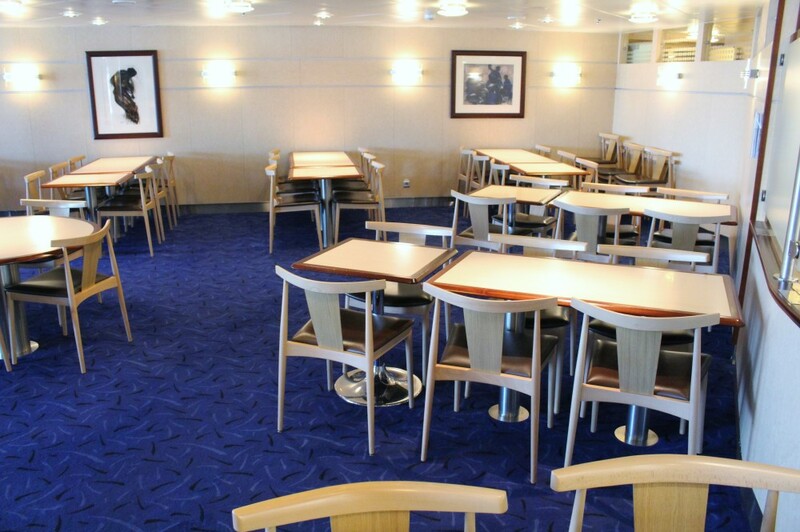 Brittany Ferries introduced the Baie de Seine on their ‘économie’ services in Spring 2015; it was immediately clear that, although still a ro-pax rather than a cruise ferry, she featured an altogether more sophisticated passenger environment than the initial économie ship, the Etretat, which retained her essentially factory-fit Visentini interior design by Studio Ancora. 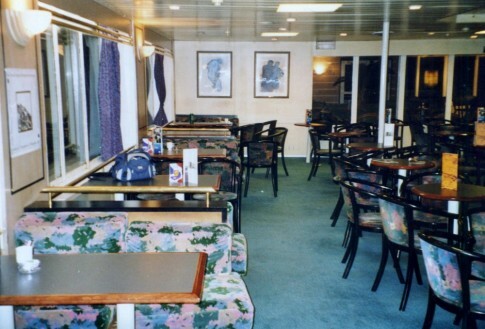 For the Baie de Seine, however, BF went to some lengths to make the vessel feel more like one of their own. 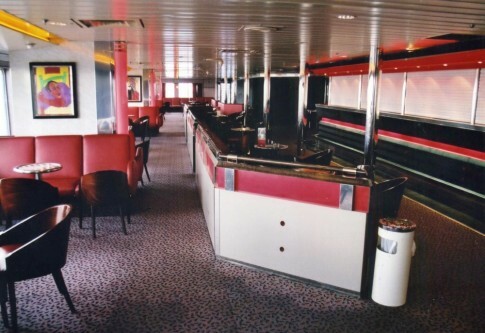 Although ordered by Lloyd Sardegna back in 1999, delays at her Polish yard meant that the ship which became the Baie de Seine was never completed as intended and the order was cancelled. 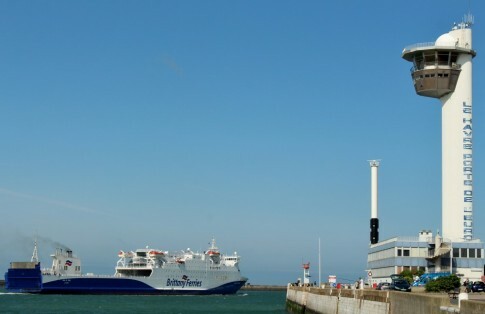 Instead, together with her earlier sister, she was acquired by DFDS and named Dana Sirena (the other vessel becoming Dana Gloria). 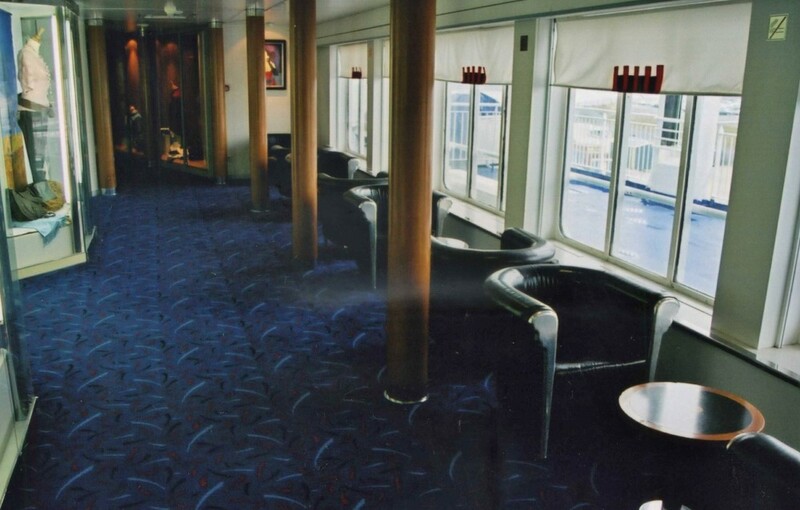 For her intended role as the new Harwich-Esbjerg ship the ‘Sirena’ enjoyed quite substantial reconfiguring with the interior design being masterminded by Steen Friis, who was also behind the Maersk ‘D’ Class and Stena’s Killingholme quartet. When the Dana Sirena, by then Sirena Seaways, passed to Brittany Ferries various pieces of DFDS artwork were removed, although some remain. 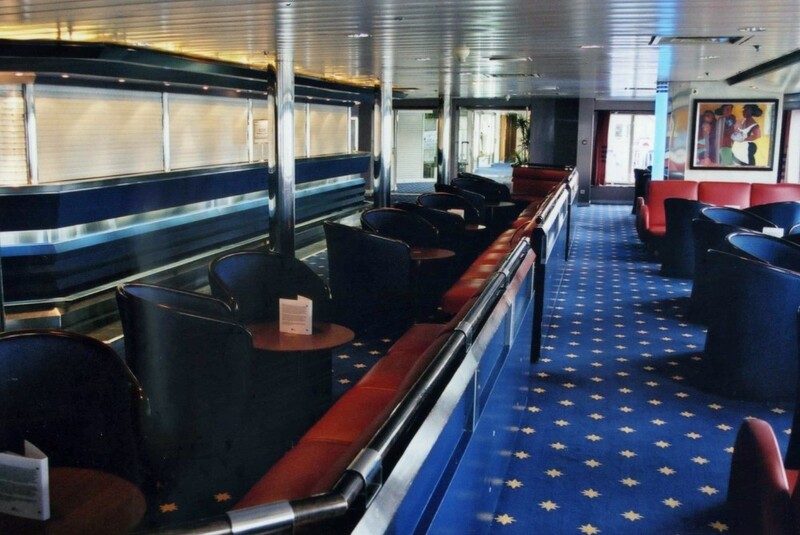 To fill the gaps, the French operator delved into their warehouse and reintroduced pieces which had once featured on earlier ships – in particular the Duc de Normandie and Val de Loire. 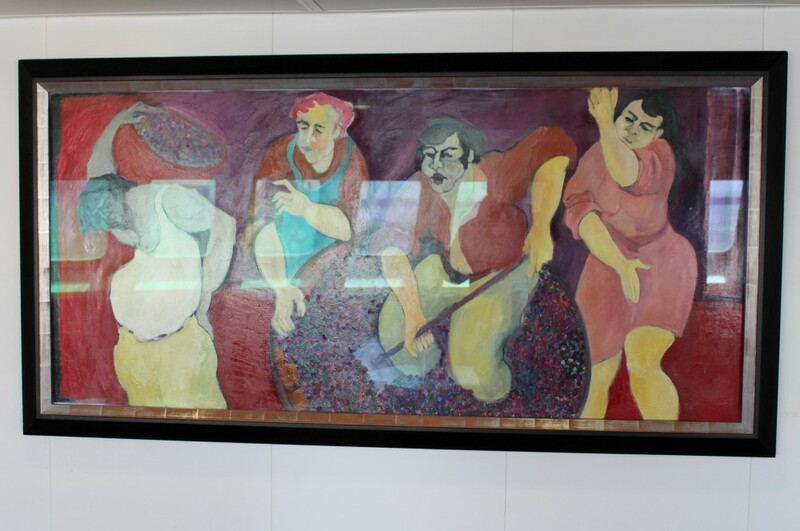 The most represented artist on board is Serge Hanin, who in the early 1990s was commissioned to provide 25 pieces for the Normandie and then a further 20 for the Val de Loire. 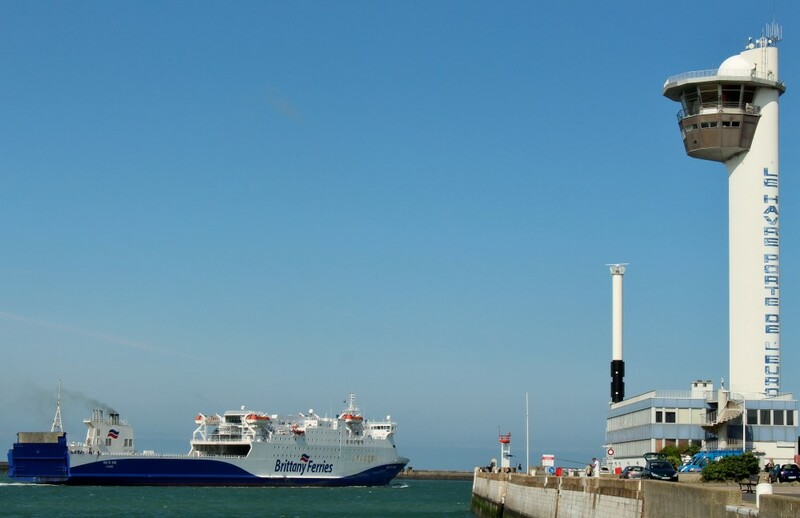 Appropriately enough, Hanin is from Lillebonne, just outside Le Havre, which port the Baie de Seine would be serving in her initial season. In a further DFDS link, some of the pieces now aboard the Baie de Seine remained on the Val de Loire when that ship was sold to DFDS in 2006. 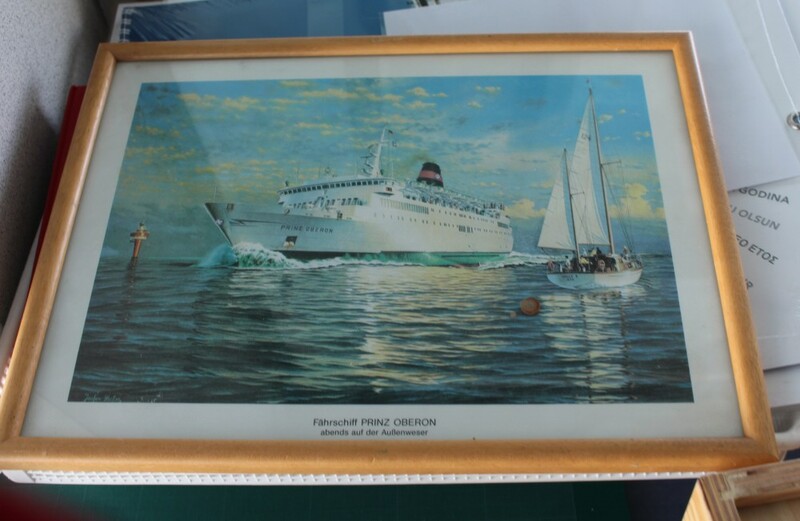 For her first year as the King of Scandinavia, she retained much of her French artwork and several of the large ship models. These were subsequently replaced with items from DFDS’s own collection and returned to BF. 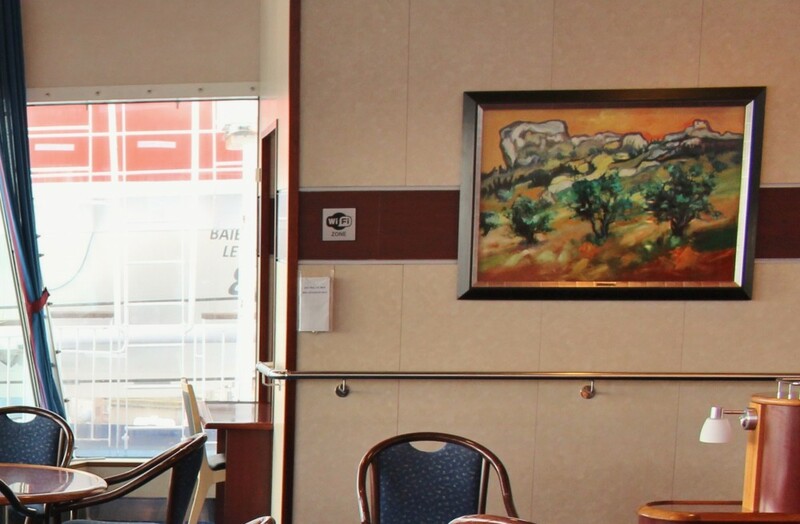 Forward on Deck 7 of the Baie de Seine is Le Cafe, which features a pair of paintings from Le Rabelais, the main bar of the old Val de Loire (the one on the right hung in the arcade leading to the bar on the starboard side). 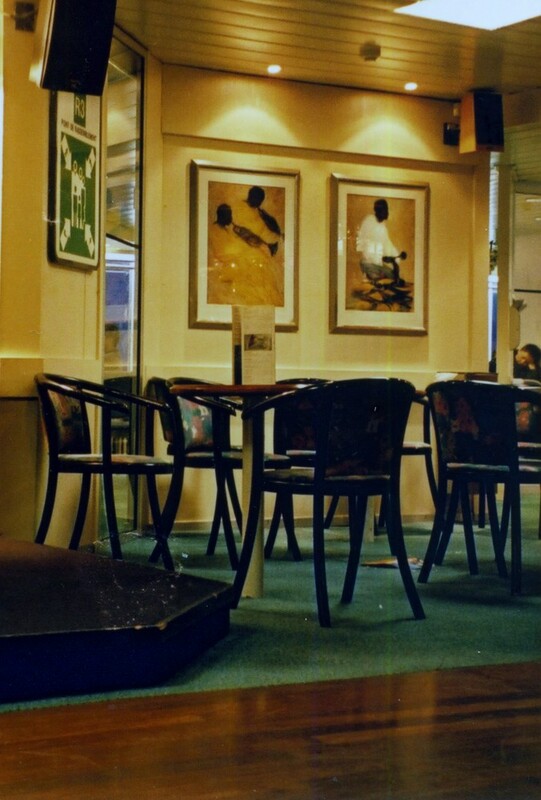 Le Rabelais, Val de Loire (January 2006). 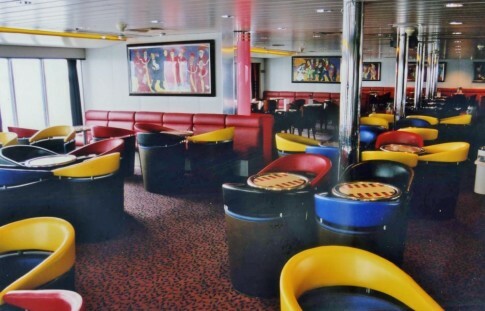 On Deck 8 forward is the Baie de Seine’s main bar; this view looking over to port shows four different pieces. The lady in the red dress is one of Serge Hanin’s favourites and she appears in a variety of his pieces. The larger painting on the left in this view was previously in Le Rabelais on the Val de Loire. 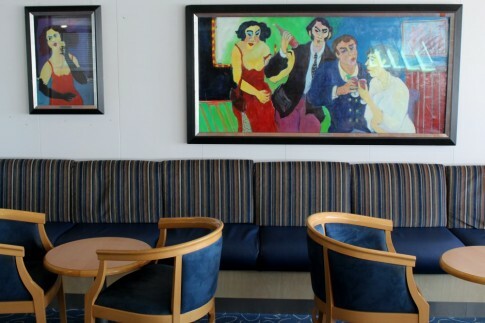 The smaller portrait hung in the seating area adjacent to the shopping centre on the Val’s Deck 9. It can just about be seen here, behind the pillar, still in position on the King of Scandinavia in October 2006. 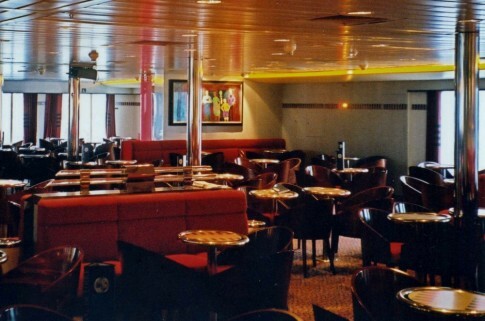 Another view of the Baie de Seine’s bar, looking this time to starboard. This bored-looking waiter was once located on the starboard side of the Le Rabelais. Le Rabelais bar, Val de Loire (January 2003). 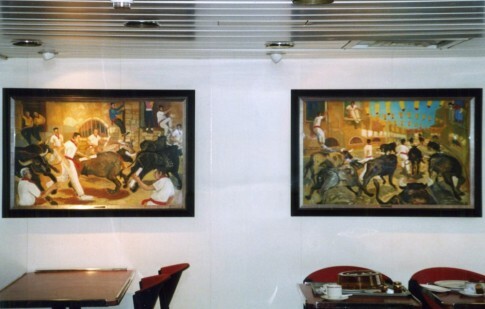 More of Hanin’s grotesques from the Val de Loire – this painting, now in the Baie de Seine’s main bar, was previously located in the forward port corner of Le Rabelais. 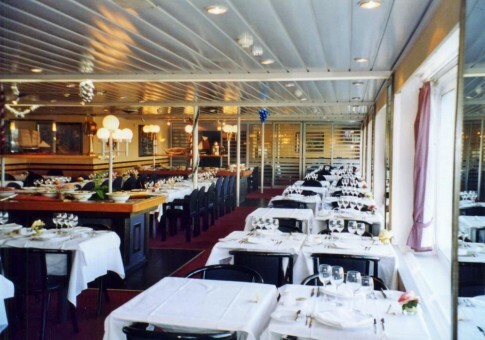 Continuing aft on Deck 8 of the Baie de Seine, next is La Formule Self Service Restaurant. This predominantly features works that once hung aboard the Duc de Normandie but the view above also incorporates another Hanin from Le Rabelais (just visible in the upper centre of this image). The Columbus Club on the King of Scandinavia (ex-Val de Loire) in 2006, with the aforementioned picture still in place. 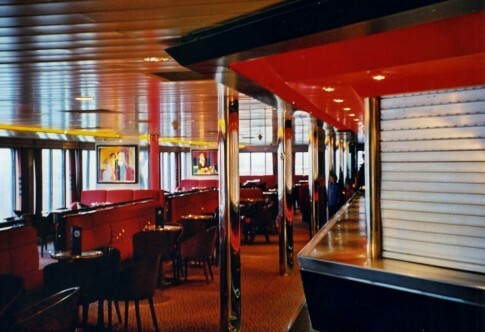 The second of the pictures in the last-but-one image is a landscape scene from the Honfleur Restaurant on the Duc de Normandie, as pictured here in 2004. The starboard side of the Baie de Seine’s self-service. 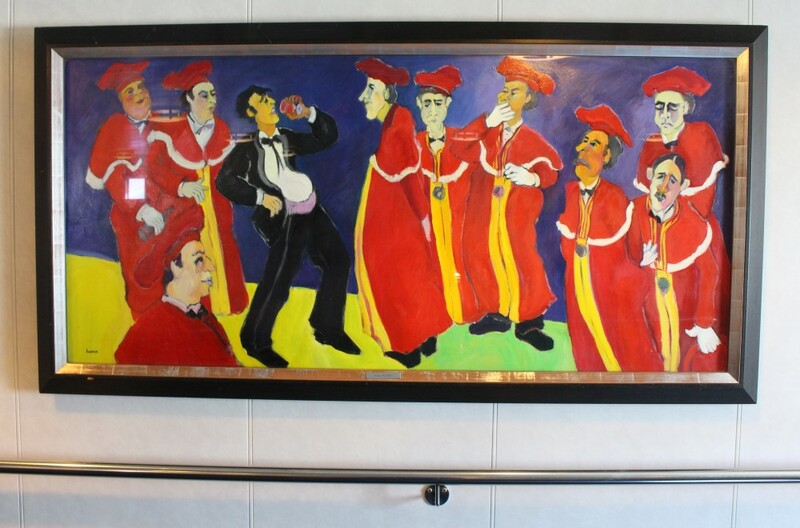 The artwork in this area is from the Duc de Normandie’s L’Alembic bar. L’Alembic bar, Duc de Normandie in 2003. La Formule self service, Baie de Seine (2015). 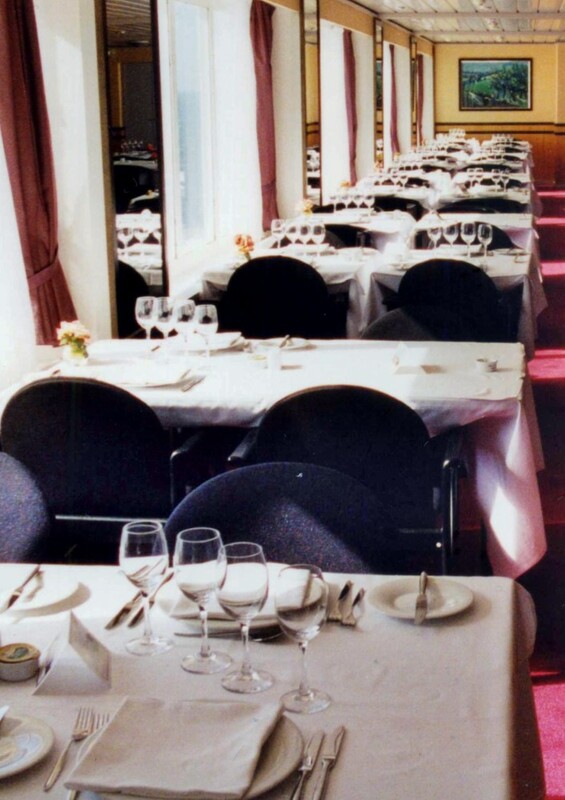 L’Alembic Bar, Duc de Normandie (2004). 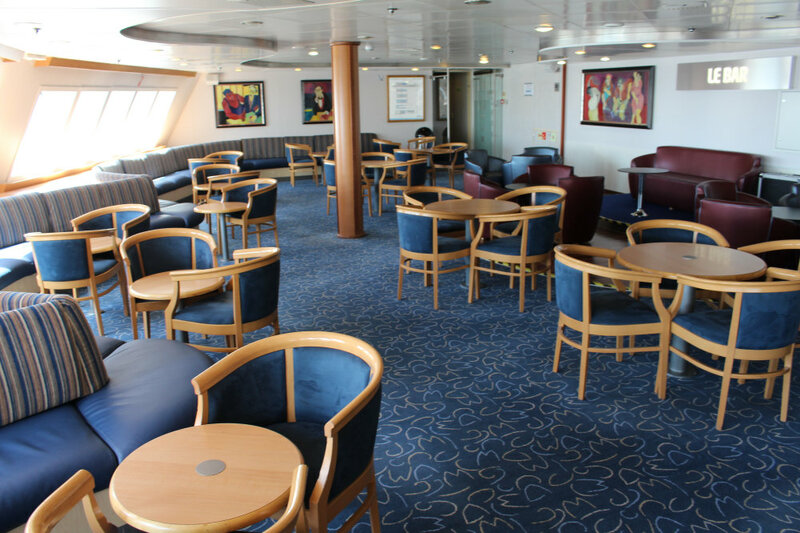 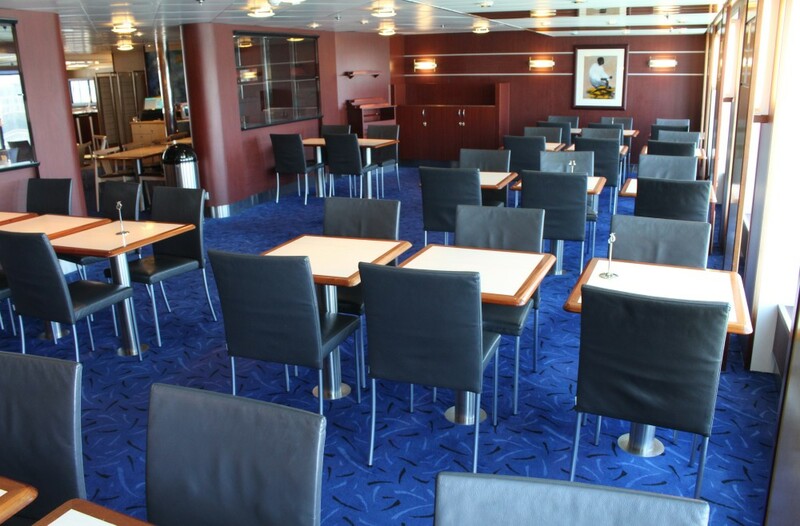 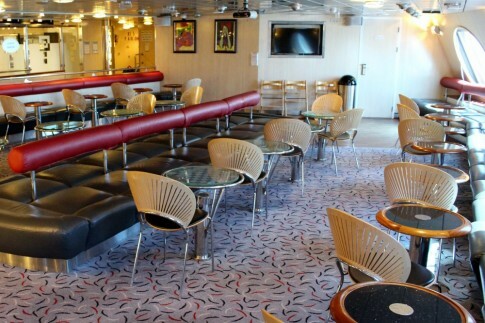 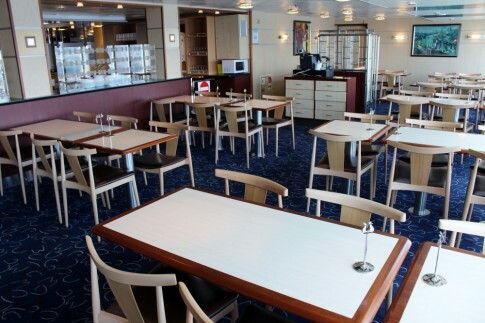 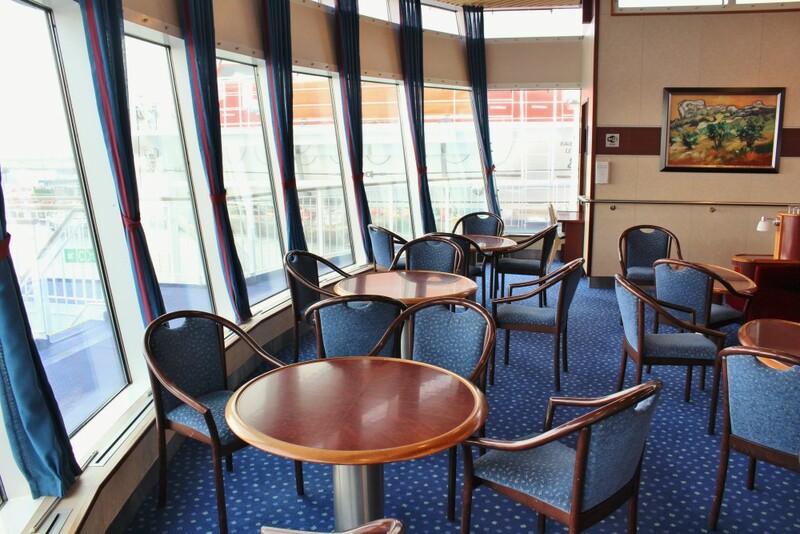 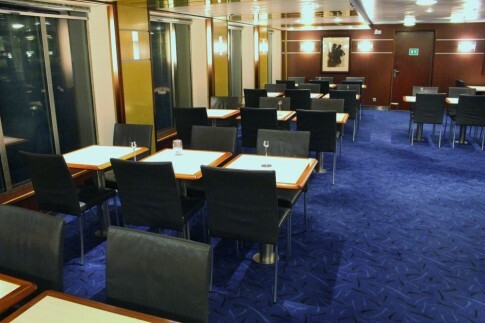 The Reading Lounge on the Baie de Seine, previously the Commodore Lounge in DFDS service. 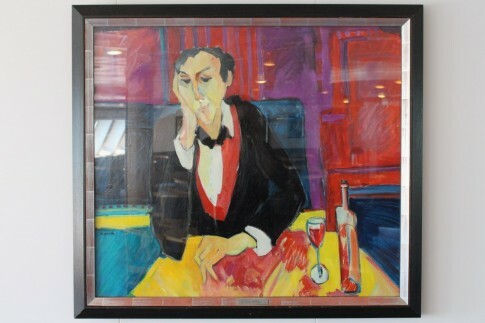 Hanging in the aft port corner is this work, by Jean Yves Blécon. This previously could be found in the forward section of the Honfleur Restaurant on the Duc de Normandie (just about visible behind the partition in this image from 2004). 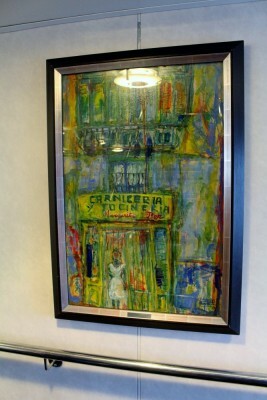 More art hangs in the Baie de Seine’s stairwells and corridors. 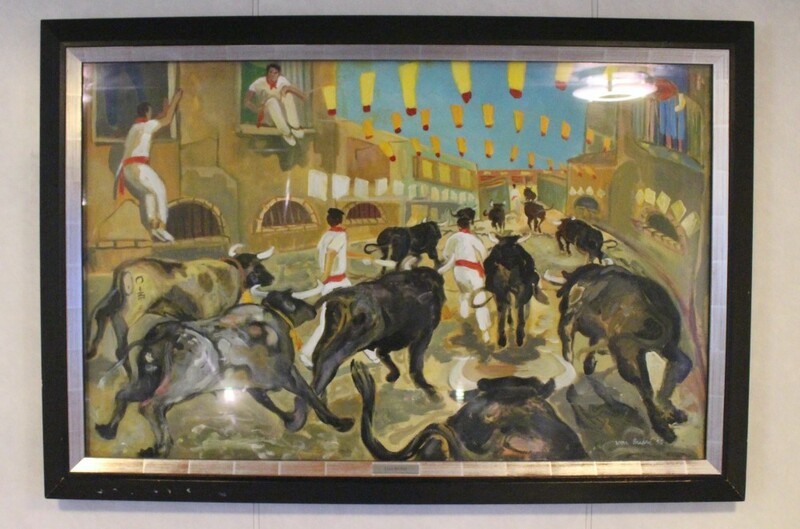 This painting shows a running of the bulls by the Catalan artist Lluis Busse. 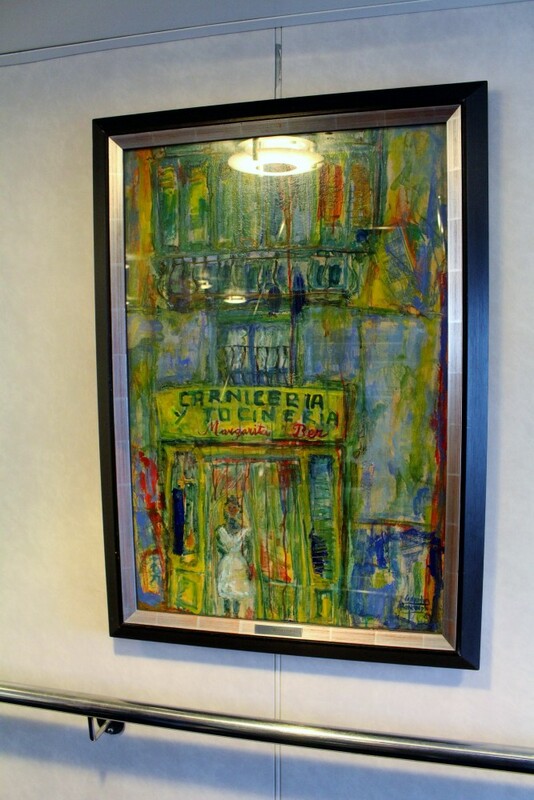 Here it is alongside a matching painting on the starboard side of La Magdalena self service restaurant on the Val de Loire in January 2006. This Hanin, in the forward port side stairwell of the Baie de Seine, is another from Le Rabelais on the Val de Loire. 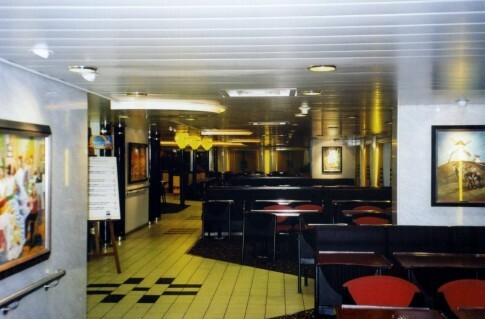 The port side of Le Rabelais, Val de Loire, in 2006. 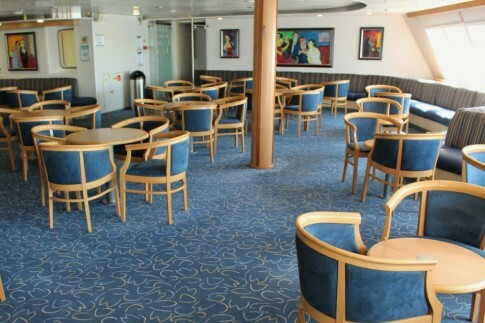 The chairs in the foreground, incidentally, were originally on the Pont-Aven. 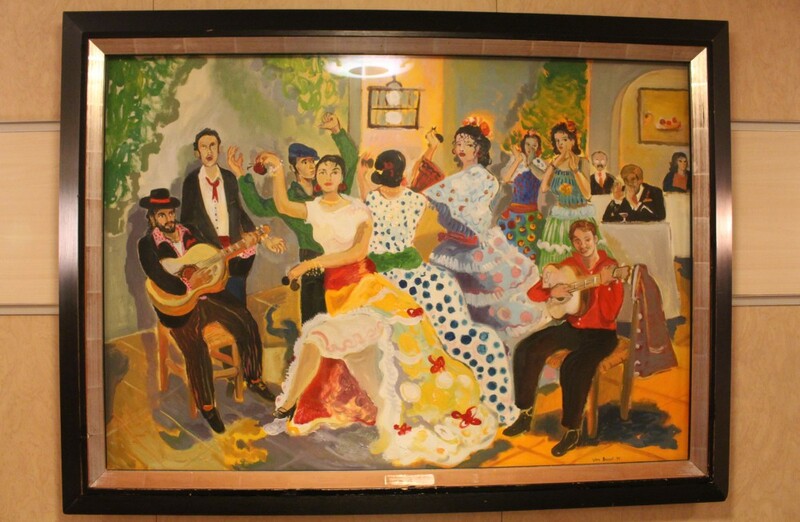 This scene of Spanish dancers is by Lluis Busse and was originally hung by the entrance to the self service restaurant on the Val de Loire. La Magdalena self service restaurant on the Val de Loire in January 2003 with the mentioned painting to the left. 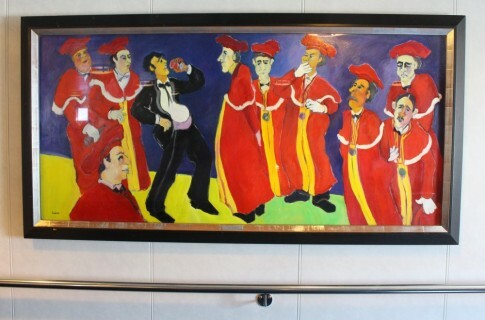 A final Hanin from Le Rabelais. 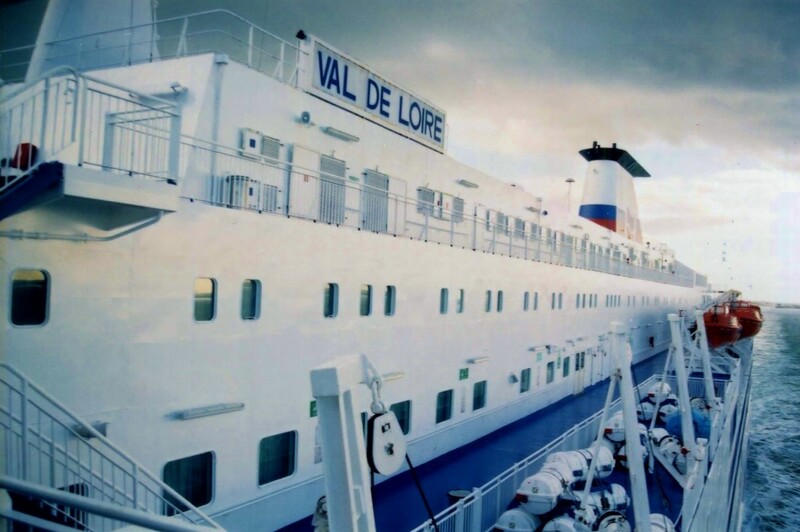 Here it is in its original location on the Val de Loire (2003). 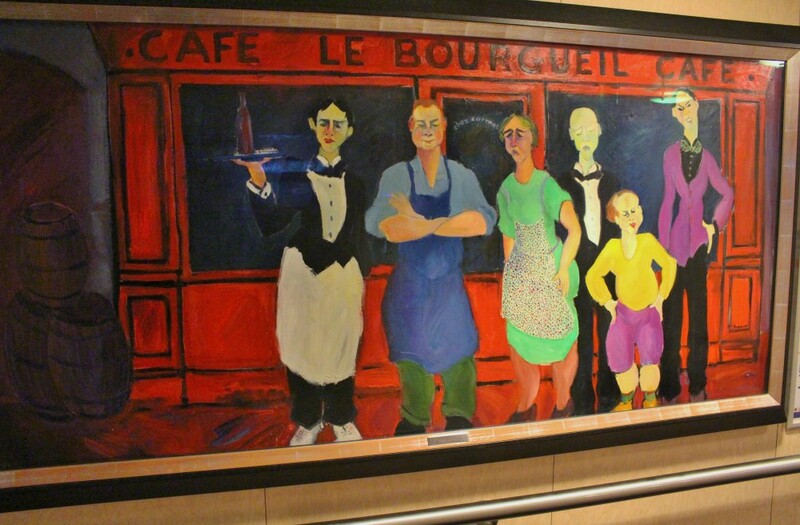 Also hanging in a stairwell on the Baie de Seine is this piece by Concepció Boncompte. It looks familiar and she definitely provided art for the Val de Loire but I haven’t been able to place it on board that ship. It is dated 1989 which would be unusual – the ‘Val’ entered service with Brittany Ferries in 1993 and the company usually commissioned artworks rather than buying them off the shelf. 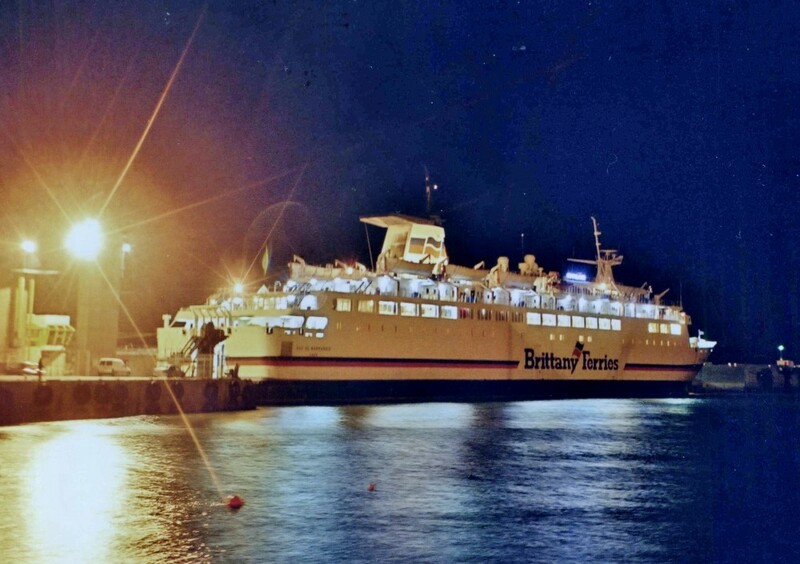 Last but not least, something slightly different graces the bridge of the Baie de Seine – a splendid image of the Prinz Oberon of 1970 which served DFDS between 1981 and 1984.